Volunteers for Abortion Rights Coalition of Canada (ARCC) are continuing their research that we reported on here into the funding of rights-denying anti-choice organizations. Specifically, we are looking for public money — government, arms’-length granting bodies — going to these gangs. Remember DJ! 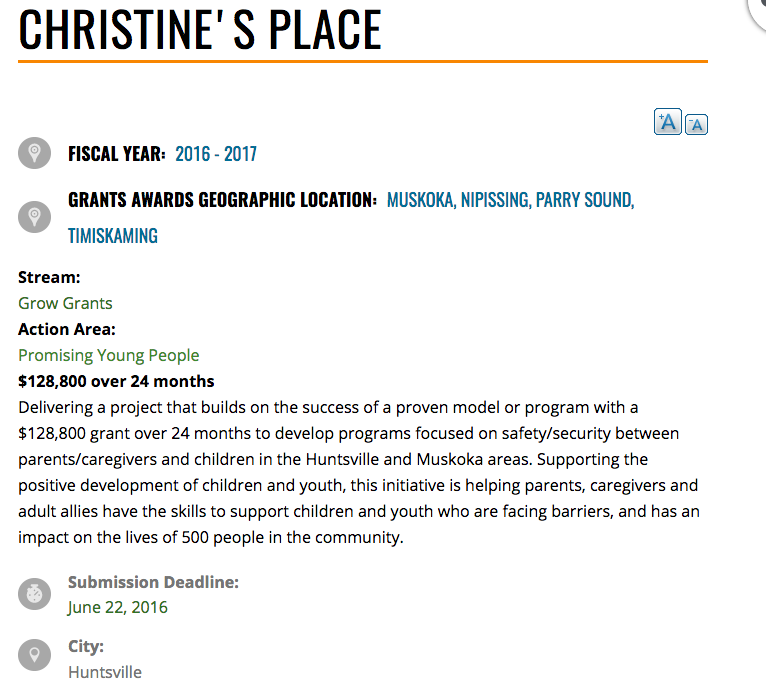 's success in getting an Ontario Trillium Foundation (OTF) grant rescinded from Lambton Crisis Pregnancy Centre? At the time, we were impressed by the anti-discriminatory language used by OTF and its promise not to fund such outfits again. 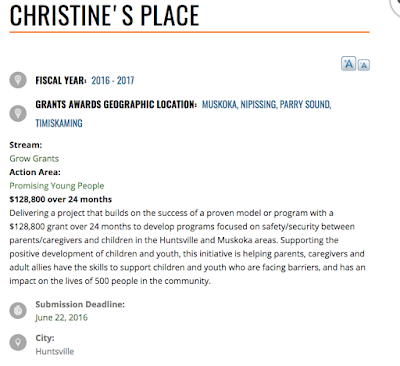 So it was with some disappointment that a volunteer ran across this, an announcement of a two-year grant of nearly $129K to a fake clinic in Huntsville called Christine’s Place. I wrote to my old bud, Thomas Chanzy, VP, Public Affairs, on Monday to alert him to this new oopsie. In light of the concerns you have raised with us, we have looked into this matter and I can confirm that this grant has actually already been rescinded in full before any payment was made to this organization. There is therefore no reason to consider your request that we rescind this grant. I want to thank you for the attention and consideration you give to the Foundation and its impact in Ontario communities. We applaud OTF for its ability to evolve and for its commitment to public input. UPDATE: My pal Thomas Chanzy has two corrections to make. 1. Trillium Foundation's budget does NOT come from gaming proceeds. Rather, funding comes directly from the Ministry of Tourism, Culture and Sport. 2. The rescinding of the grant was at the request of the organization itself. So, it seems we credited OTF with a bit more evolution than is warranted. We'll keep our eye on grants awarded.